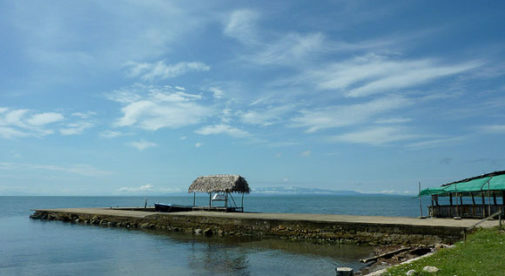 Every now and again, when life feels hectic or I fear I’m getting into a rut, I think of little Punta Gorda, Belize. It’s become one of my favorite places to dream of visiting again. Right down near the southern tip of Belize, Punta Gorda looks out on the blue Caribbean. The barrier reef and its wealth of marine life—one of Belize’s main claims to fame—is 30 miles offshore here. That means it takes longer to reach the reef from here than from other coastal spots in Belize…but, in exchange, Punta Gorda has a feeling of wide-open seas and endless space unlike anyplace else I’ve seen on mainland Belize. From Punta Gorda, I can imagine setting sail for parts unknown. The horizon is very wide and beckoning. But I can also imagine just sitting on a dock someplace, basking in the sun and the sea breeze while I enjoy a cold one. There are several little seaside restaurants where you can do just that, mingling with locals, expats, and tourists. One night at dinner I even met some young expats—scuba divers working with various outfits—who’d come over from Guatemala. (The border is quite near, and there’s also a ferry between Punta Gorda and Guatemala.) And given the dinner I’d just had—super-fresh seafood and veggies, washed down with the local limeade, all for about $12—I could understand why they’d made the trek. Punta Gorda is definitely a tee-shirt and flip-flops kind of town. Laid-back. Easy-going. With the sea at your front door and lush, green jungle at the back. Inexpensive, too—you can find rentals for as little as $400 a month, if you ask around—and day-to-day expenses are low. All things that Punta Gorda’s expats love. The town has enough restaurants and shops for daily needs. These aren’t fancy—but if you miss swank amenities, just a couple hours’ drive can take you to the Placencia Peninsula. There you’ll find million-dollar homes and high-end beach resorts, with spas and restaurants. If you’re not yet ready to completely retire, Punta Gorda is wide open with possibilities. With its inexpensive, no-pressure lifestyle, it could be a good place to start your dream business—the one you daydreamed about while sweating in the corporate trenches. Like opening a chocolate factory. Or a B&B. Or doing jungle tours. Punta Gorda expats have done all of these things. These are the kinds of adventuresome careers—lifestyles, really—we dream of as kids. Here, expats can have another go at that childhood dream—or even invent a new adventure. Personally, Punta Gorda inspires me to take up scuba diving—to get my certification and at least try it out. In this water-centric town, I’d have plenty of company. And plenty of boats to take me out to the reef. And at the end of a long day in the water, I could join the locals at a seaside restaurant, letting the sea breeze cool me as I tucked into dinner.